Senior Gifts Students gather in the Druckenmiller Hall atrium at the kickoff event for the Senior Class Giving Campaign last week. The Senior Class Giving Campaign (SCGC) officially began at its launch event last Thursday with hopes of continuing the College’s tradition of strong alumni giving. 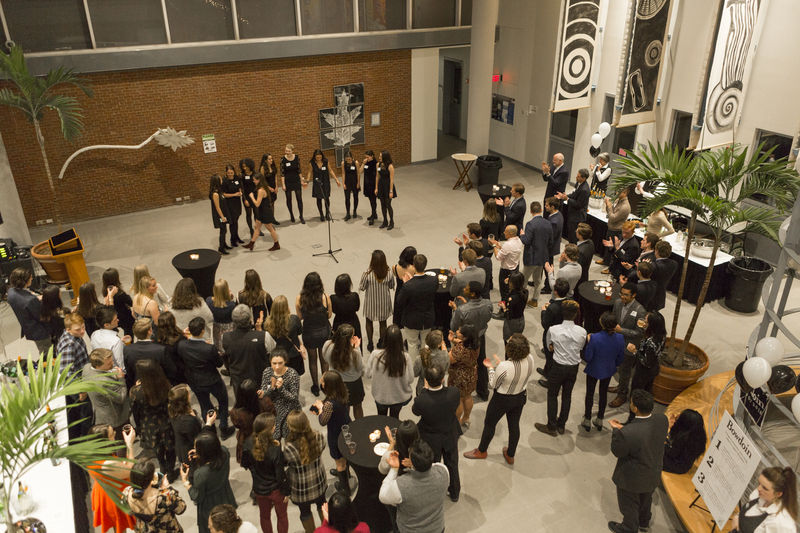 SCGC has a two-fold purpose: to raise awareness about the importance of giving back to Bowdoin after graduation and to solicit donations from seniors this semester. If the campaign is able to reach its participation goal, the Class of 2018’s senior gift will be granted in the form of a scholarship for a future student. If 60 percent of the class participates this semester, which means donating at least five dollars, and 60 percent continue to donate for four years following graduation, then each year, an anonymous donor, who is an alumnus and parent of a student in the class, will donate $10,000, which will create a $50,000 scholarship for an incoming student. According to Audrey Leland ’18, one of four directors of this year’s SCGC, giving even five dollars can make a significant difference to the campaign. “If you give that five dollars, you are helping to unlock that $10,000 gift, so when you think what significance does your gift has, it helps us achieve that [scholarship],” she said. Bowdoin has a particularly successful history of alumni donations. The alumni percentage of participation in annual giving—which is calculated as the percentage of those who donate of those who are able to be contacted—typically falls between 54 and 61 percent, according to Senior Vice President for Development and Alumni Relations Scott Meiklejohn. In 2017, Forbes ranked Bowdoin fourth in the nation among private colleges in its Grateful Graduates Index, which is based on participation rate as well as total donation size. Meiklejohn believes that Bowdoin’s success can be attributed to a wide variety of factors, such as the opportunities it provides for its students and alumni, the College’s need-blind, no-loan financial aid policy and its close-knit community. In addition, the development and alumni relations team works to find meaningful ways for alumni to stay involved in the College. Part of the job of Leland and her fellow SCGC directors Osa Fasehun ’18, Grace Mallett ’18 and Austin Stern ’18 is to find ways to engage their fellow class members about the importance of donating. Together, they selected 30 class agents who are tasked with reaching out to 10 to 15 of their peers and educating them about the campaign. Even after the official campaign is over—four years after graduation—the agents will continue to keep in touch with classmates and encourage donations. Leland initially joined the campaign because she wanted to give back to the College and hopes that others will share her perspective. Donations can have multifold impacts. According to Meiklejohn, seven percent of Bowdoin’s operating budget comes from donations. Contributions can also have implications for how outside entities judge the College’s institutional quality. Both Leland and Mallett encouraged all seniors, even those who may not have been satisfied with parts of their experience at Bowdoin, to consider donating.